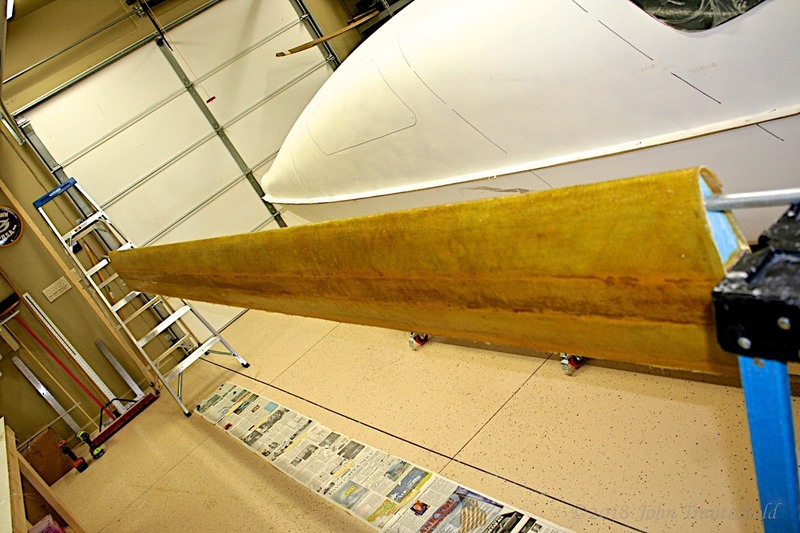 Laying up the fiberglass for the canard is very similar to doing the lay-up for the wings. It’s accomplished in three steps. Three separate lay-ups are needed to fully glass the canard. I start with the bottom side, which is Lay-up A. Once the lower cores were attached, the assembly is leveled in preparation for the first of three layups. Lay-ups ‘A’ is now complete. 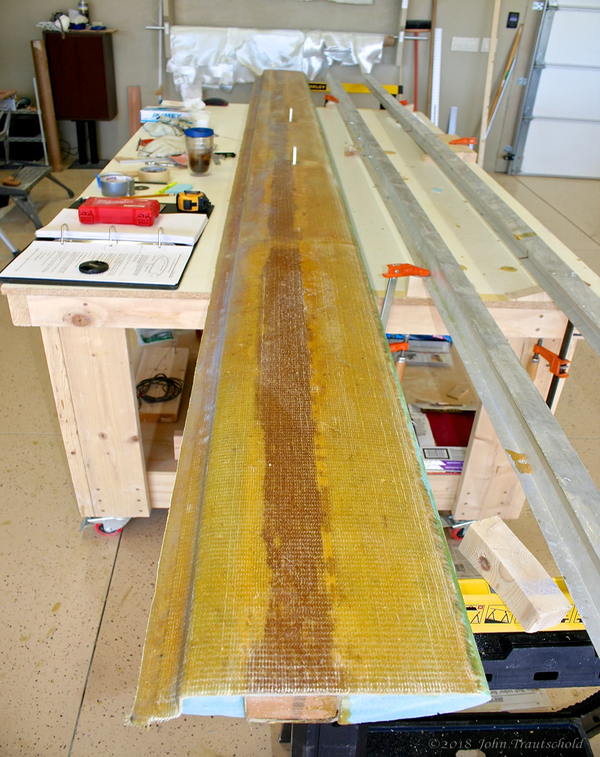 The epoxy is cured and it’s time to flip the canard over to glass the top side! This side is complete - time to flip it over and glass the top side! 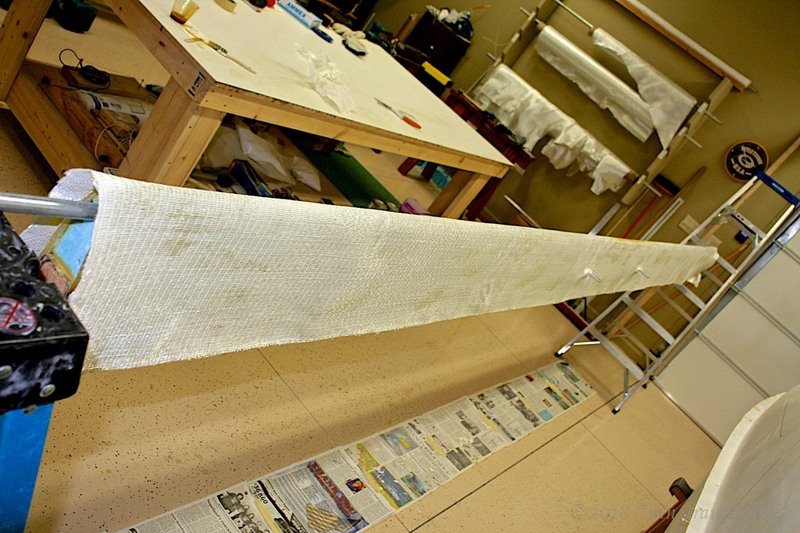 Here’s a closeup of lay-up ‘B’ before I apply EZ-Poxy to the fiberglass. The glass is in place waiting for a coating of EZ-Poxy to cement it into place. Finally, after lay-ups ‘A’ and ‘B’ are fully cured, it’s time to hang the canard vertically to prepare it for lay-up ‘C’. 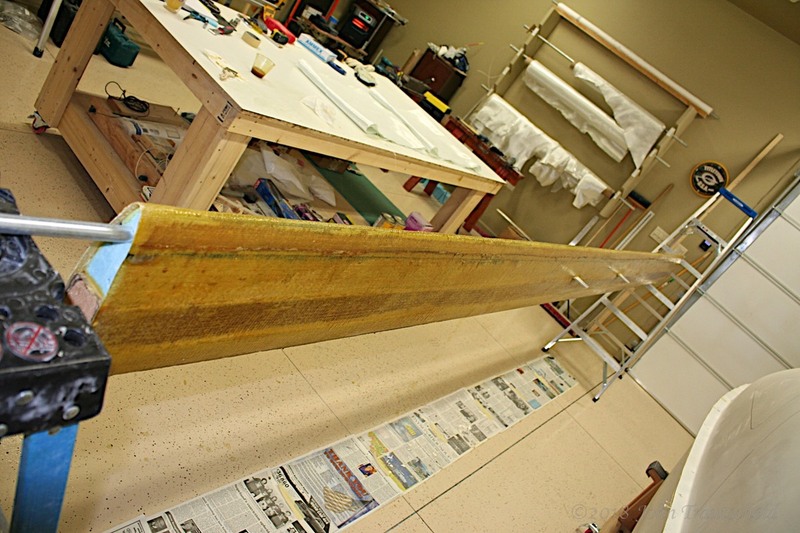 The canard is 15 feet long so the manual recommends inserting 1/2” electrical conduit in each side along with a couple of supports (ladders, in my case) to let it hang. In order to insert the pipe, I actually crreated a sharp edge on one end of each section (using my grinding wheel) to help it cut into the foam. Once the first two layups are finished, I have to hang this thing vertically to complete the 3rd layup which completely covers the first two! 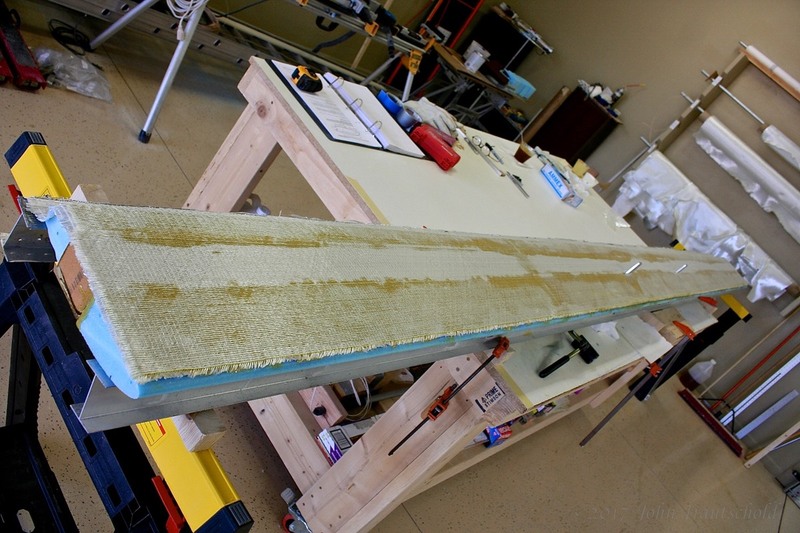 Here's a shot from the opposite side before adding the 3rd layer of fiberglass. Lay-up ‘C’ is now started. 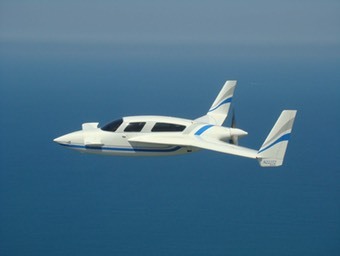 The triax fiberglass is in place, but the EZ-Poxy hasn’t been applied yet. This actually turned out harder than I thought it would. When applying epoxy to a relatively flat surface, I pretty much just pour it on and spread it around. In this case I couldn’t do that since it would all just run off, so I hard to brush it on bit by bit. The entire process took a couple of hours! Ugh! 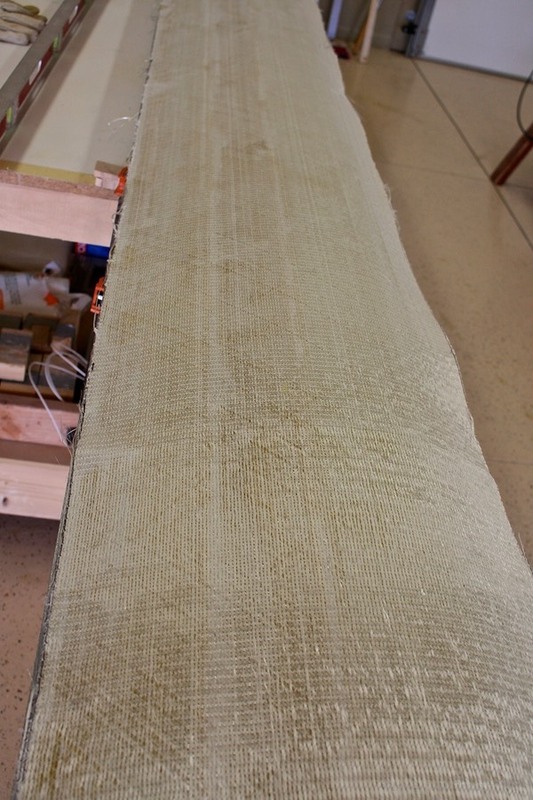 This is one continuous piece of fiberglass and it was a real pain getting it place! This final lay-up took about two days to fully cure. I also ran into an unexpected problem which, while fairly easy to resolve, was also a pain to do! I’ll talk about that a bit more in the next section. Now it’s time to build the elevators!